Publicados 9º Outubro 2018 por Jon Scaife & Arquivado em Tecnologias Web. I use the addon “Chrome UA spoof­er”. Eu defini o meu agente usuário Mozilla/5.0 (Windows NT 10; Win64; x64) AppleWebKit/537.36 (KHTML, like Gecko) Chrome/66.0.3359.117 Safari/537.36. Devo ter sido usando o Chrome 66 at the time I fixed this ori­gin­ally. Simply get your cur­rent user agent by ask­ing google (por exemplo. 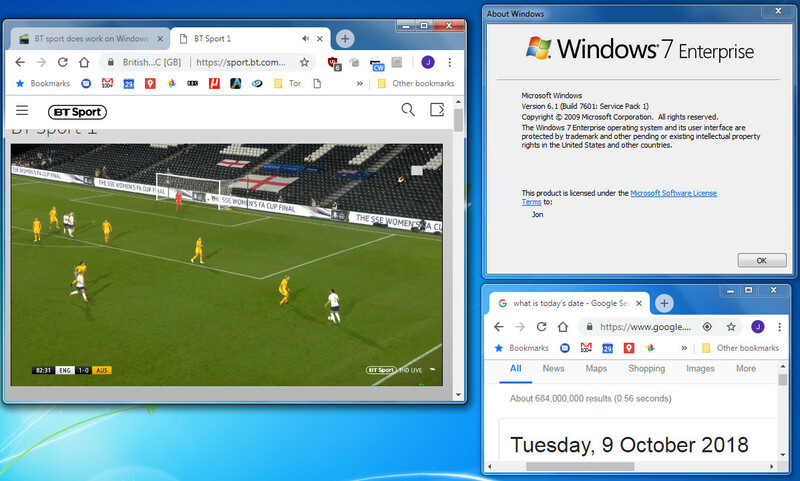 mine is cur­rently Mozilla/5.0 (Windows NT 6.1; Win64; x64) AppleWebKit/537.36 (KHTML, like Gecko) Chrome/69.0.3497.100 Safari/537.36) e depois substituir o Windows NT 6.1 com Windows NT 10. Add this newly cre­ated user­agent in the Chrome UA spoof­er options. Dê seu user-agent um nome (por exemplo. Chrome W10), make sure “Replace” is selec­ted rather than “Append”, and use some­thing simple for the indic­at­or flag (por exemplo. W10). To clear your cook­ies (em cromo) para apenas o site desporto bt: primeiro carregamento do site (sport.bt.com) and then click on the pad­lock in the address bar. Click on “cook­ies” and then in the list remove all of the entries. You will have to log in again when you next vis­it. Agora, fechar e reabrir o Chrome, ir para o desporto BT, e entrar. You should see the UA Spoof­er icon in the taskbar show a bit of blue text over­layed on itself which will be the “indic­at­or flag” you cre­ated earli­er (i.. W10). You should find that BT sport now works fully with the enhanced play­er. O que você acha? Deixe-nos cair um comentário abaixo! Se você gostaria de assinar por favor use o link inscrever no menu no canto superior direito. Você também pode compartilhar isso com seus amigos usando os links abaixo sociais. Cheers. HTML5 especificação final e publicado!